As you may already know we are currently focussing on the book ‘Going on a Bear Hunt’. On Monday afternoon the children and Penny added a Bear Cave to the environment – because of Alex’s concerns about ‘bears’ and ‘caves’ it was important the children were involved in making the cave – and besides that it was great fun to do it together. So on Monday we put up the playhouse and talked about it, then we draped a large piece of material over it – which funny enough Penny had spotted and put in the trolley of scrap last week when we visited WRE (Goodness looks like Penny did some pre planning!) We talked about the cave we had made and the fact that under the material it was still the Tweenies house. Then the children added the new teddy bears – and the ones we had used when focussing on Goldilocks and the three bears. In went the children, out came children and bears – in, out – in, out with much laughter and squealing – for about 45 mins. 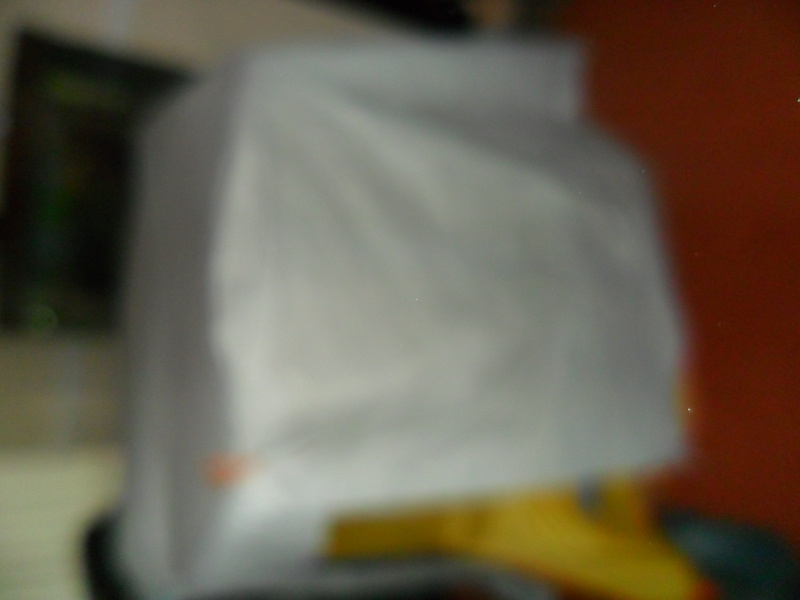 Then because of an agreement with Mr. Penny’s Place (that the lounge is clear of childminding stuff when he returns from work – which is fair enough as I still have to kitchen, the play room and the conservatory to use until the children go home) the ‘cave’ had to go away. So Tuesday morning first thing (6:30) – Chinzia helped me re assemble the cave and put the bears back in. After breakfast all 4 children played together – going on a bear hunt. Penny was not required to support or join in – this was definitely a children only game. So Penny supervised from a distance – and listened in to the delightful conversation – and it has to be said imagination. All -We are going on a bear hunt, we are going to catch a big one , We’re not scared’ (for some reason mine don’t use the phrase ‘What a beautiful day’ – don’t know why – but they don’t).OH NO mud – sticky mud – we have got to go through it (as you can see they adapt as they act out the story) Squelch, squelch. Oh no we are stuck! All – We are going on a bear hunt, we’re going to catch a big one. A forest OH NO we have got to go through it. Stumble trip, Stumble trip. At this point all four are tripping on purpose and falling on the floor – much laughter – picking them selves up – and doing it again. All We’re going on a Bear Hunt – They all then push their way into the cave grab a bear and scream! IT IS A BEAR. Of course all run out of the ‘cave;. At this point Shona drops into a crawling position and roars (likes a lion if I am honest – but very effective) the others scream and run into the middle room throwing themselves onto story corner mat and lie down in a neat row. We forgot to shut the door says Chinzia- and she gets up and shuts the door between the middle room and the lounge where the cave is. The three of them lie giggling on the mat saying Shona Bear is coming – and indeed there she is still on all fours, still roaring bear / lion like – until she gets to the mat (and then just as in the story) she gets up and walks back to the ‘cave’. They then take turns to be bears – no negotiation- no support from Penny – just taking turns – as one goes back to the cave another drops into crawling position to be the bear. This game lasts for well over an hour and a half – in fact until snack time. I had to remind myself of the ages of these children – 3yrs 6m, 3yrs 2m, 2yrs 8m (x2) none of them have older siblings, none of them go to other groups with older children, none of them have engaged in this level of role play before – in my opinion – outstanding – and rather than a next step – it was more like a huge leap forward. Just a short blog – but the children were so excited at nap time when they saw their new ‘ready beds’ – I just had to record it. Up to now the children have been sleeping in lie back buggies and prams – apart from Chinzia who has been having her nap on the sofa. I have been slowly collecting second hand ready beds over the last few months. All have been washed and couple needed new air mattresses. I decided that today would be the day when I introduced the new beds and put away the buggies until the next intake of babies. The children were curious when I started up the pump and the excited when they saw not one, not two, not three but four bed unfold and reveal themselves. Much discussion about who was going to have which bed – Alex thought he should have the Bob the builder one , Shona could not make up her mind, Chinzia wanted the ‘princess one’ – and as a result Mia also wanted a princess one (just as well two of those ) – and so by default Shona has the Peppa Pig one. Never have the children finished lunch, toileting or got into bed so quick! Within seconds they had all given Penny ‘orders’ for which Teddy they wanted for nap time – Iggle Piggle for Alex, Spotty dog for Shona, Hello Kitty for Mia and Upsy Daisy for Chinzia, they snuggled down, they said how comfy their new beds were. Penny put on the classical music and left the room. ……… just as Penny expected ……. 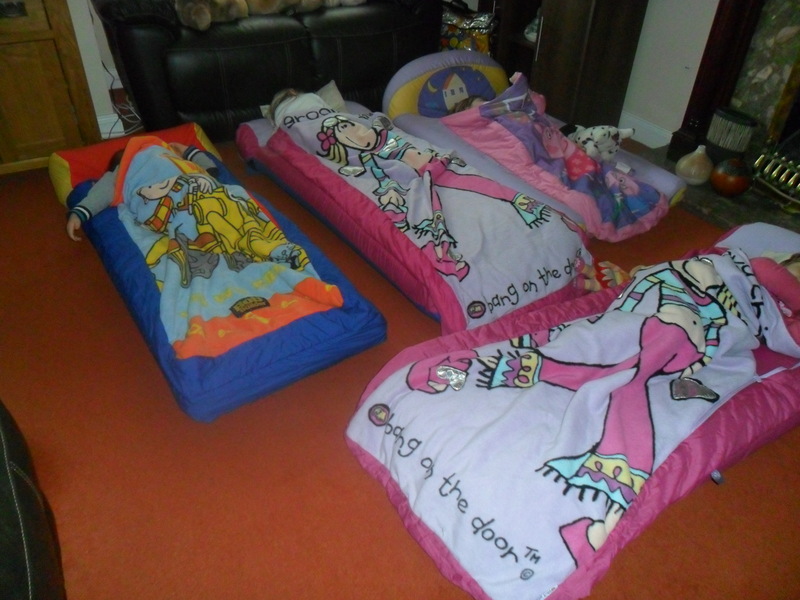 They fidgeted, they chatted, they sat up, they got out of bed, back into bed and so on ……. This was the first conference of Early Childhood Action and was held on 27th October 2012 at Winchester University. I had booked at place and thanks to a generous discount offered if 3 or more colleagues booked with me I paid just £68 for my place – as did my friends Carol, Sally, Brita and Debbie. This price included lunch and 3 refreshments breaks with tea/ coffee/ pastries or biscuits. In my opinion very good value. I had decided that I would prefer to stay overnight both on Friday and Saturday night to save being over tired – as Winchester is just over 2.5 hours away from where I live. Carol did not get a lot of choice – as travelling in my car – but as a bonus she did get a free weekend away in return for keeping me company and providing excellent discussion and debate. Therefore Carol and I set off for the conference on Saturday morning from the guest house in Stockbridge- just 10 miles from Winchester University – and arrived in time to check in and meet up with our childminding colleagues Sally, Brita and Debbie. We took at look at the books on sale , and could of had a drink and pastries – but Carol and I were still full from our breakfast so declined the offer. So on with the conference – The keynote speaker was Baroness Susan Greenfield who is a neuroscientist based at Oxford University. Her presentation was on ‘The Young Mind of the 21st Century: Realising its True Potential’ . Fantastic speaker – down to earth, humour, fast paced but easy to follow. As someone with very little knowledge in this field I found the talk, thought provoking and reassuring. Thought provoking as in just what is possible in the future and how much we still have to learn about the human mind – just what will the future be like? robotic people? ability to control everything and communicate just by thinking? Also lots to consider from the ‘I would like to suggest …’ comments from Susan. Reassuring because some of what Susan was saying reinforced my own limited knowledge about how children learn and most importantly the things that very young children can not master / achieve because developmentally difficult, if not near impossible (exceptions to the rule, as always, possible). I have to admit there was so much packed into Susan’s presentation that I will have to wait for the information to be forwarded before I try to recall and comment on everything . Next speaker was Dr. Richard House – who spoke about Early Childhood Action (ECA) and Open Eye, and of course the new framework that ECA were launching at the conference. At the time I thought Richard could have explained a little more about the ‘Early Years Framework’ (EYF) BUT having now had time to read the document that contains the EYF- I now understand that everything is within the document including the rationale and the explanations about various aspects. I am going to go off at a tangent now – but hopefully you will understand why. Those of you who have known me for a while – will know that back in June Dr. House was in communication with me (and others) about his intention to send a letter to Nursery World in reply to my letter about the EYFS 2012, in which I had stated that I like the EYFS 12 and the focus on play. But more importantly the fact that EYFS 08 and EYFS 12 had raised the professionalism of childminders among parents and other professionals. I stand by this – as those things are still true – on the whole I do like the EYFS 2012 – as it gives practitioners a lot more flexibility and control over their own settings and the curriculum they offer. My problem is those who ‘read’ more into the statutory framework than is actually there – and then advise / train others based on this viewpoint. I do not like the early learning goals – at all – and in my childminding setting the ELG’s are not mentioned or referred to in documentation. I am against teaching of phonics especially as the one and only method of teaching children to read. But again I do not worry myself about this in my setting . I am against children who were born prematurely, having to enter school by birth date rather than due date. I am against suggestions that the children should all experience the same curriculum and that other curriculums can not be used – unless exemption from the EYFS is granted. I am against pre planning, against adult activities that give no choice in either taking part or outcome, against the idea that children need to have every minute of their day filled with adult suggested ideas or experiences or activities. I am against the idea that children need to be prepared for school, that who they are and what they can do now, is only useful to push them onto the next stage of being ready for school – in fact in my personal opinion starting school at 4 or 5 means that most children will not be ready for a formal learning environment – and will ‘fail’ before they even complete reception year. And so although I do ‘like’ EYFS 2012 – because I have the confidence to ‘do it my way’ – I do in fact agree with most of the ideas behind ECA and the EYF. Hopefully if Dr.House ever reads this blog post (or others on my blog) he will understand why I was at the conference. Short coffee / comfort break – opportunity to look at and buy books – and of course to network. After the break, the speaker was Dr Simon Boxley from the University of Winchester. His presentation was on ‘Efficiencies and Expediency: Speeding the Unhurried Pathway?’ which was basically about why this government and previous governments do the things that they do (have done) – which in layman’s terms is to get the most out of the population for the least amount of government effort and expense! In particular women into work – and children into school and out the other end as efficiently as possible. Of course I and many others would argue that government efforts have been in vain – because they are going about it the wrong way! One other thing stuck in my mind from Simon’s talk – DEBT . Parents have very little choice about working as they have so much debt – and although not mentioned in Simon’s talk – in my opinion, many childcare providers also have very little choice – either through debt incurred in setting up their business, overdrafts because overheads are increasing but income staying the same – add to that unpaid bills, shortfall in government funding – and in my opinion you have an unexploded bomb. Parents unable to pay and childcare providers unable to stretch their finances any further – sooner or later the bomb will go of. There was only time for a very short question and answer session – which was a shame as lots of people had questions they wanted to ask the panel. However lunch was ready and so we had to break. Lunch was a cold buffet and was very enjoyable. In a blink of an eye we were back in the lecture theatre ready for the next presentation – which was by Penelope Leach. She spoke about the importance of not rushing children through childhood and the importance of those people who support the very youngest children – the babies – and about the babies ‘rights’ as these are often overlooked or not considered important or even valid. Then to a small, but nevertheless heartfelt cheer from myself and the other childminders – she mentioned the idea of encouraging parents to become childminder as when their child goes to school – which in her opinion is not workable and not in the interests of the children (hence the cheer). Penelope also showed us a clip from You tube of two very young children communicating with each other – with much laughter both on the screen and from the audience. The next speaker was Professor Colwyn Trevarthen who spoke about babies and their amazing ability to tune into sound patterns from birth (in fact before birth) and how they can not only follow the patterns of sound when their mother sings to them but and conduct it – and actually lead it by being just in front of the mother (demonstrated by video footage and visual graphs). As an early years practitioner all of this made such perfect sense – about babies ‘knowing’ their mothers voice, how they learn language, why singing to them and use of nursery rhymes and songs in an early years setting is so important – and so valuable. Another short comfort break during which I managed to buy the book ‘Too much, Too soon; – which I shall provide feedback on once I have read it. I spoke to Marie – Louise Charlton (the lady who did all the organising – including the discount for myself and my friends)- and she in turn introduced me to Richard House ( and I completely forgot that I had just purchased the book and could have asked him to sign it – silly me). Onto the last speaker of the day – Sue Palmer. I had heard Sue speak before (at the Education Show a few years go) and so knew about her view on boys learning – but today she was speaking about the culture of marketing and the impact on very young children – I knew this was going on – but was horrified to be told the the marketing departments are now targeting babies as young as six months! (because as soon as a child can point -they can put pressure on mum and dad to buy the things they have seen in TV adverts). The worry is that many parents do not realise that when they buy the things that their baby points to – just because the baby points – they are setting a situation that will soon get out of control – with 2 and 3 year olds throwing tantrums and screaming loudly until they get the desired item ( and in my view – it is only a small step further before school age children decide that if they want something they have a right to it – even if it means stealing money from mum or dad or from friends – or direct from the shop). As an interesting aside, Carol and I were talking to the guesthouse owner at breakfast on Sunday – and the lady asked us our opinion of baby sign language because her daughter (mother to 6 week old) had decided not to use baby sign language with her baby because she had seen friends babies and toddlers using the signs to get the things they wanted – and the mothers had no control – terrible thought that babies could combine skills in sign language with TV advert marketing to get their mothers to buy things or do things they did not need or want to do. Of course Carol and I made sure we reassured this very new grandmother that it was not sign language that was the issue – it was parents who were unintentionally falling into the trap of thinking that children needed everything they wanted – which of course is just the sort of child the marketing people want – and that it was just a case of boundaries and common sense to ensure that sign language could be used for the child to communicate but not to dominate. As the conference came to a close there was time for a few questions – not enough time- as I for one had my hand up – but did not get time to ask my question as time ran out. A final refreshment break before myself and my friends headed to a pub for our tea – but before we did so – opportunity for me to speak to Linda Pound (another of my breakfast companions at the Early Years 2012 conference – and (sorry Linda unashamed self plugging) to discover she had read some of my blog – and in particular the blog about the Early Years 2012 conference. It seems that readers of my blog include the famous as well as friend, family and colleagues. Over tea in the pub we had much to discuss and think about before our friends headed home – and Carol and I headed back to our hotel. Carol then had to put up with my further reflections on the day and debate, before breakfast, after breakfast, before heading home and during the 2.5 hr drive home – thankfully Carol was doing as much reflection as I was and so I think (hope) I did not bore her. As I say I have a lot to think about – and have read the EYF twice now – as soon as time allows I will write a blog about the EYF and my views on it and how it fits (or does not fit) with my personal ethos and the practice here at Penny’s Place. We started the day with a bit of a recall about our trip on Wednesday to Wonderland – and looked at the photo’s again (the children love looking through the photo’s and frequently do so). We then made a large chocolate sponge cake – for no other reason than Penny had some cream in the fridge that needed using. On this occasion Penny did most of the ‘doing’ following the instructions from the children – who also ‘demanded’ to look in the bowl at every adding of ingredient or mixing action by Penny. There was a lot of counting, describing – and I am pleased to say – explaining. Previous blogs about cake making have described how the children were puzzled about where the things put in the bowl went – particularly the eggs. They had now worked this out – and explain in detail about where the eggs etc are still – ie in the bowl – just ‘mixed in’ – a big scientific understanding for little ones. After the cake we read ‘Going on a Bear Hunt’ – we have now adapted the story because Alex is still not very comfortable about the bear – and so we now say the bear wants to play – and is very sad that the people shut the door and he can’t go in the house. Luckily there is a picture of a sad looking bear walking back to his cave. This extension of the story also supports the children’s knowledge and understanding of the world – as they thought the bear had toys in his cave – and Alex thought the bear had a DVD player and TV in the cave! They now know that the bear does not have these things in his cave and that is why he wants to play with the children in their house. Alex is now much happier about the bear in the story. (I have to admit I am just waiting for the children to decide the bear should go shopping to buy his own toys – and if that happens we will of course extend the story again – because if that is how the children want the story to develop – it would be wrong to prevent their creative thinking). Today I decided (gosh – I planned) to try a slightly different approach to our sticking activity – rather than all of them do it at the same time or two at once – I wanted to try each child working on the picture by themselves – I also wanted to remove myself further and to supervised from the doorway rather than at the table. My reasons being that I had a feeling that the children were not being creative in an individual way due to interaction from me and the others – and possibly some ‘copying’ of ideas. Not saying that anything wrong with either of these points – and indeed can promote creativity – but I think can also hinder personal creativity. 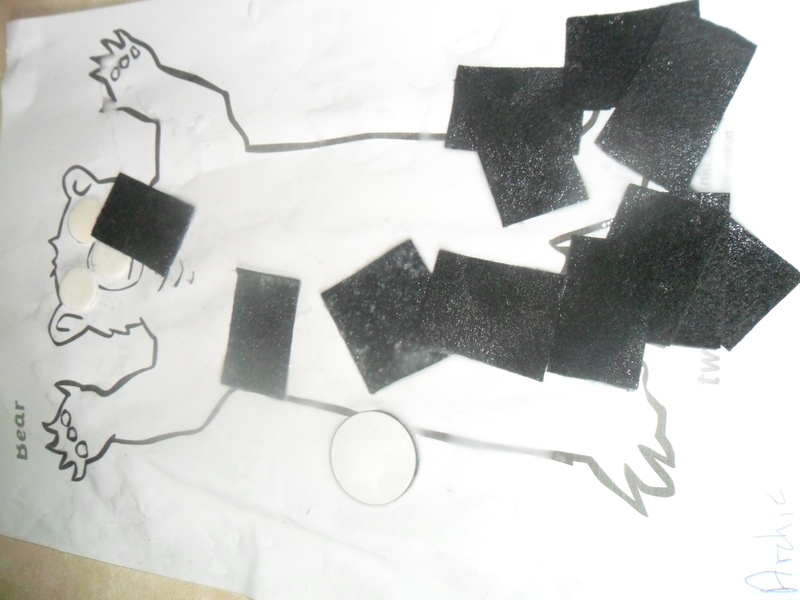 The children were given a pre printed outline picture of the bear from the story, a choice of small felt pieces in different bear colours (browns, black, and white ) some white circles (one size) and black cirles (3 sizes) and a pot of PVA glue complete with spreader. Chinzia went first – lots of glue all over the bear, then she stuck on some felt pieces, then three white circles – on the face but in slightly alternative places, then some more felt pieces. Shona next – again lots of glue – a very quick adding of felt pieces mainly on picture but some not, two white circle eyes in the right places and a black circle nose – again in the right place – and finally some very small black circles on one of the bears arms. Alex was last to have a go – now Alex surprised me – last week when gluing his leaf picture he applied lots of glue to the paper then added leaves – but today he took a very long time to carefully pick up each felt piece – apply glue directly to it – and then carefully stick into position that he choose – interestingly though some were stuck outside of the bear outline. Two large black circle eyes were added in the right places. Parents were surprised at their child’s creative abilities and were even more surprised to find out that I did not give any directions or suggestions and had supervised from a distance. Time then for a quick lunch of Beans on Toast and fromage Frais before all getting ready to fetch Dominic from school. For those of you who don’t know Dominic is my 8 year old grandson and he has Aspergers – and as Dominic will proudly tell anyone and everyone ‘I go to a special school – you know it is full of Aspergers’. We are fetching Dominic today because his mum has a hospital appointment and won’t be back in time – we are fetching Dominic at 1pm because Dominic is still in the transition stage of being reintroduced to formal school after a year out of school – and of course being gradually introduced to the new environment of his new school. After we have collected Dominic we drive for 5 minutes to Worcester Resource Exchange – my local Scrap Store – Dominic is delighted to be going to Granny’s ‘Junk Shop’ and tells everyone ‘My Granny is buying junk – you can make things with junk. The lady at the desk recognises the mindess and says ‘Oh here are those good children – I have got some stickers if you are good again today’. Nice to know that the children have a reputation in the wider community for being good. We went back to Penny’s Place – looked at the stuff we had brought – had snack time and then took Chinzia and Erin home, then Dominic went home. And as a bonus Alex and Shona were collected early- leaving just Penny and Archie for the last hour or so. Today was one of those planned days out – that did not quite go to plan – but was nevertheless a very nice day out! I had a tip off that Groupon had a very good deal on a family ticket to Wonderland in Telford Park. So good that I just HAD to buy it ! So what was the deal – well for a mere £12 – 5 people could go for the day to Wonderland – access all the rides and attractions AND each child would also get a Halloween goody bag. Now as it happens we don’t include Halloween in the festivals and celebrations that we cover at Penny’s Place – but even so I thought that there would be enough ‘non Halloween’ things for the children to enjoy that it would be still worth going. Parents were all happy that we were going – so I brought the voucher – in fact it was the first ever voucher that I had brought from Groupon . Now as you all know I have five mindees on a Wednesday – so I had to ask Carol if one of my mindees could walk through the ticket place with her – no problem she said – all sorted. So four instead of five mindees for the trip – then my daughter Rosie (who is registered as an assistant ) phoned to say her car had brokenand was in the garage, and so would not be able to go to work (she works in a children’s Center). My luck was in! Do you fancy a trip to Wonderland I asked? Thankfully she did – so a email to Carol to explain the changes – all re sorted! We set off early – picnic, pushchair, outings bag, potty, 4 mindees, me and Rosie. Children excited – me suffering from lack of sleep- Rosie worried about cost of car repair. We meet up with Carol at the pore arranged spot and off we go in convoy – Carol in front. On to Telford – change of leader as we approach Telford because my Sat Nav programmed with free car park details. Another unplanned bit – we thought the car park was a 10 min walk from Wonderland – in fact it was less than a minute walk and we were there! Showed the two vouchers (Penny’s and Carol’s) and in we went 3 adults and a total of 7 children. We headed for the rides – and come across a giant – a very large giant! What’s more he is talking to us! We stand and watch for a while but Alex is not very keen and a bit worried – so we move on. First ride is the rabbit ride – me, me say Shona and Erin – and one of Carol’s children. Alex and Chinzia most definitely DID NOT want a ride. Nice gentle ride going slowly round the track. The girls loved it. Next ride please! What about the Caterpillar Ride say Carol and I – both having spotted the twirling teacups – that may be were not 100% suitable. Yes, Yes,Yes – the same three girls wanted to go on the Catterpillar. In they climb – seat belt and bar should have warned me about this ride – but it didn’t. 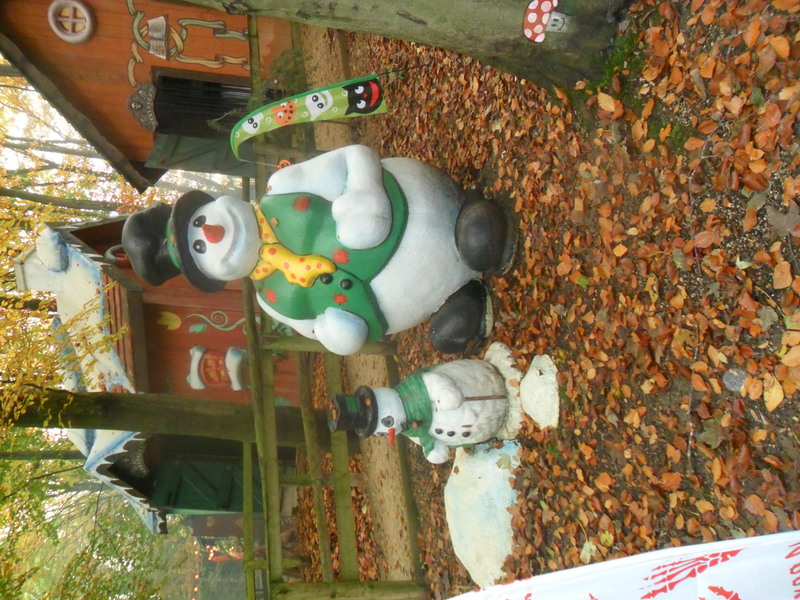 We then head to the loo’s – (nice inside soft play area – but not using it today) -and after toileting , we set off on a mini adventure – through the forest following the path – we spot lots of little houses – and a queue to collect the goody bags. We look through the windows of the little houses and can see characters from fairy stories – Chinzia is not sure but after reassurance that it is only pretend and that we are not going in the houses, she relaxes and starts to chat about what she can see. Alex is even less sure ‘No like it’ he says and stays close to Penny – he looks through the windows but only briefly and if he thinks it is scary – he backs off. The three girls – Erin, Shona and one of Carols run ahead and chat (loudly) about what they can see. They are not familiar with all the stories but describe what they can see. However when we get to the display of three houses and three pigs – they know about that story. Even Alex and Chinzia stand and look and chat – because of course the story of the three little pigs was our topic / focus book a few weeks ago. We then met up with our friend Jen and continued on our adventure – we passed some dinosaurs complete with loud noises – yes of course Alex did not like the noise despite his interest in toy dinosaurs at Penny’s Place. Penny understands why though – the noise was not very dinosaur like! After looking at a few more little houses (and we did not see them all) we back tracked and started looking for somewhere to have our picnic – the only bench we saw in that part of the forest was right by the loud speaker making the dinosaur noise! So we continued until we got back to where the queue was for the Halloween goody bags – and although far from ‘a nice picnic spot’ there were at least some unoccupied benches. So picnic was eaten there – Rosie who finished lunch first was sent to stand in the long queue to hold our place until the children had finished lunch – once they had finished the five oldest children (4 of Penny’s mindees and 1 of Carols), Rosie and Penny went and collected the goody bags – while Carol stayed with the buggies and her two baby mindees. We were given empty goody bags (nice large ones) and then had to follow the path to several different little houses. It was dark in all the houses and in each one was a person in Halloween costume and in character. The children did not like it – Alex hated it and clung to Penny crying – however Alex did not want to go out because he wanted the things to go in his bag (in each house another small item was added to the bag) Shona soon got the hang of it and was keen to take the items – and even to say thank you – the others needed support to move forward to collect the items from the characters. Once we got outside the last little house, the children were full of it – and wanted to go and tell Carol all about it – their fear having disappeared. By now it was time to head home – the children chatted both on the way home(until they fell asleep) and once back at Penny’s Place about their day out – and by listening to them you could tell they had had a lovely day. Well to be truthful we have not actually been on the Bear Hunt yet – but we will at some point. So today we changed books – first because interest in bridges was beginning to reduce but also because I have noted an interest in hiding with the children – so hiding themselves and hiding things. The final reason is to do with their language development as I want to focus on positional words – which of course there are plenty in the story ‘We”re Going on a Bear Hunt’ – plus lots of repeated refrains – perfect. When the children arrived they took part in the usual free play, had breakfast and settled down (I always find first thing on Mondays we need to have a period of time to re establish boundaries and just to settle back into things). Then I asked if they would like to watch a DVD – they did – and were a little surprised – watch a DVD – in the morning – never heard of at Penny’s Place! So we settled down on our cushions to watch – and within seconds they were interacting with the DVD – repeating the refrains – and showing a range of emotions. Shona in particular was very expressive – and it was a delight to watch her as she did the actions and facial expressions. After the second viewing Penny introduced the toy bears – a polar bear, a black bear and a brown bear – all from the TY range so fairly representative of bears – without the ‘scary bits’ such as sharp claws and teeth – and of course without size comparison. Alex was reassured when he saw the toy bears and happily played with them. Whenever we start a new focus book – we always make new placemats – sometimes these are word mats printed from Sparklebox – but I did not like the ones to go with this story – too many words and not enough pictures. 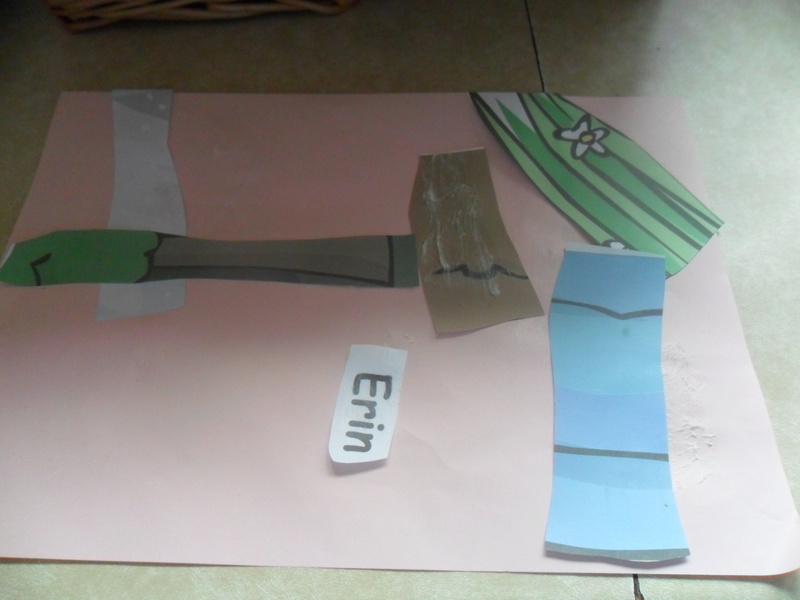 Sometimes they are collage type with the children sticking on pre cut pictures to go with the story. 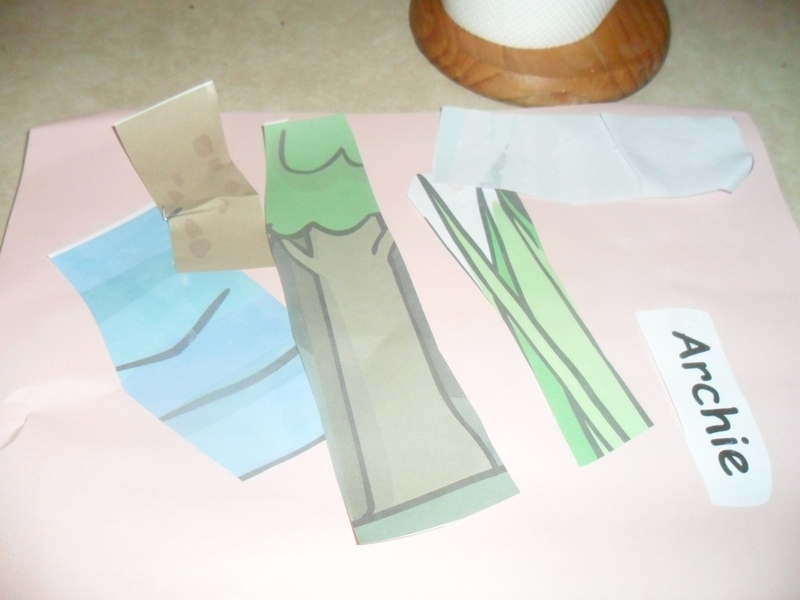 Today we talked about all the different environments in the story – river, woods, mud, forest, snowstorm and of course grass – I had pre cut pictures of these environments (from Twinkl – just a small section of bigger pictures) and I had also printed each child’s name. 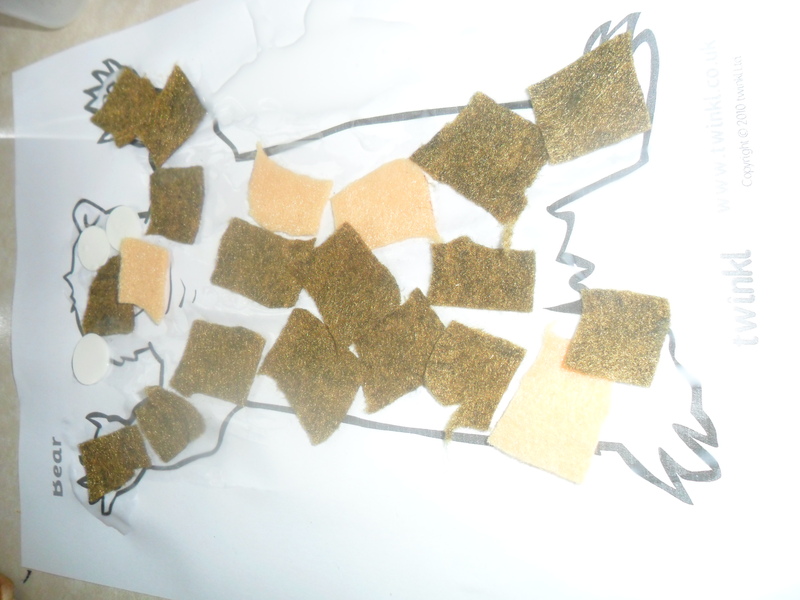 The children then produced their own mats (although of course I did the laminating) Photo’s taken before the laminating. Our second activity was to start our new display – so we put up some pictures of different bears – including a Teddy Bear- and a title ‘We’re going on a Bear Hunt’ again from Twinkl – but printed a smaller size. 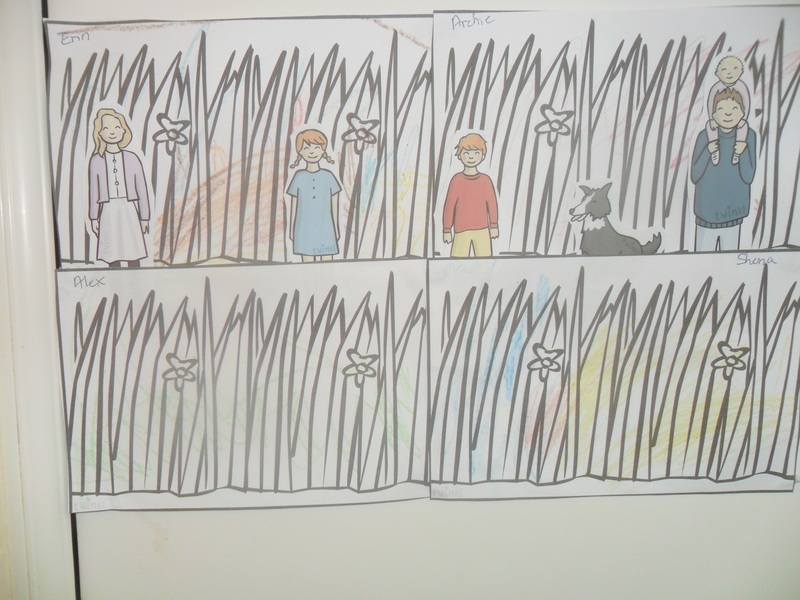 Next the children coloured some pictures of the long wavy grass (yes, from Twinkl), I cut out some pictures of the characters – again from Twinkl – and we then created the first bit of our display- which as you might guess will grow over the coming days and weeks. The children then carried on playing, had lunch, nap time and then more playing (until our usual DVD time just before home time) but the thing I noted was that the children were acting out parts of the story – using the toy bears and repeating the refrains. The country park is about a 30 min drive from Kidderminster and neither Carol or I had been there before, but Jen had and it was on her recommendation that we were trying it out. There is lots of space, hundreds of foot paths and therefore walks in different directions, a play park – two different sections but within the same secure fenced area. 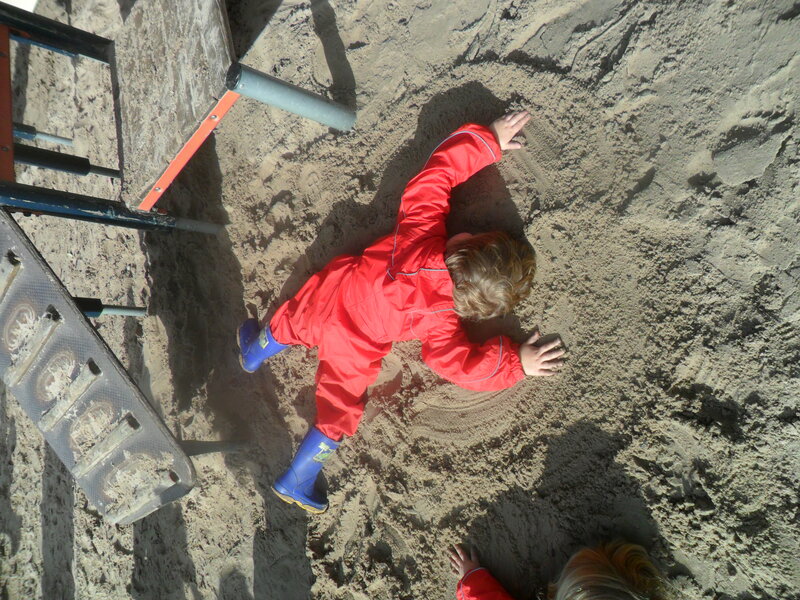 The area most suitable for little ones is set in a huge sand pit – fantastic. There are toilets near the play park and also near where you enter the park a cafe selling drinks and food – we didn’t try the cafe as we had taken a picnic – but Jen says it is reasonably priced and sell things that kids like such as beans on toast. We started with a walk – and with in minutes they had found a large muddy puddle. Of course once they had found one puddle – they just had to find more! 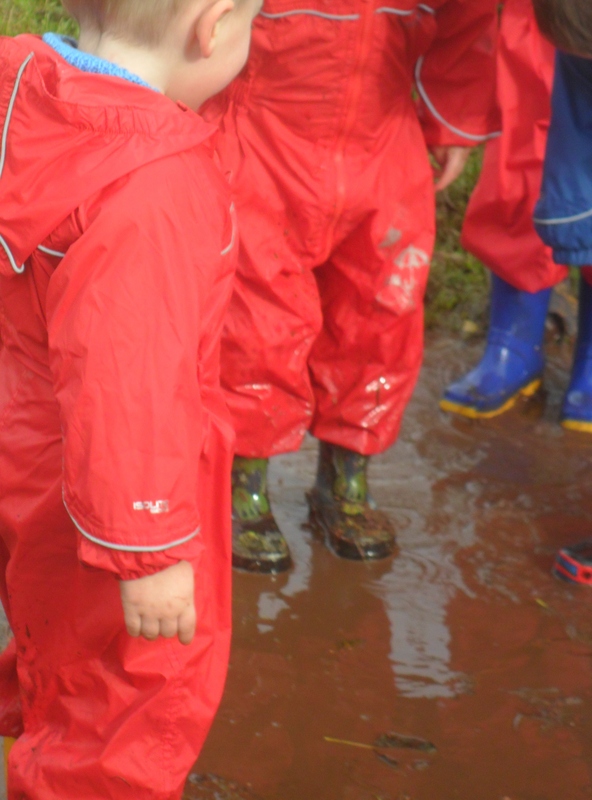 Soon they were covered from head to foot in muddy water – but were having such a fantastic time. 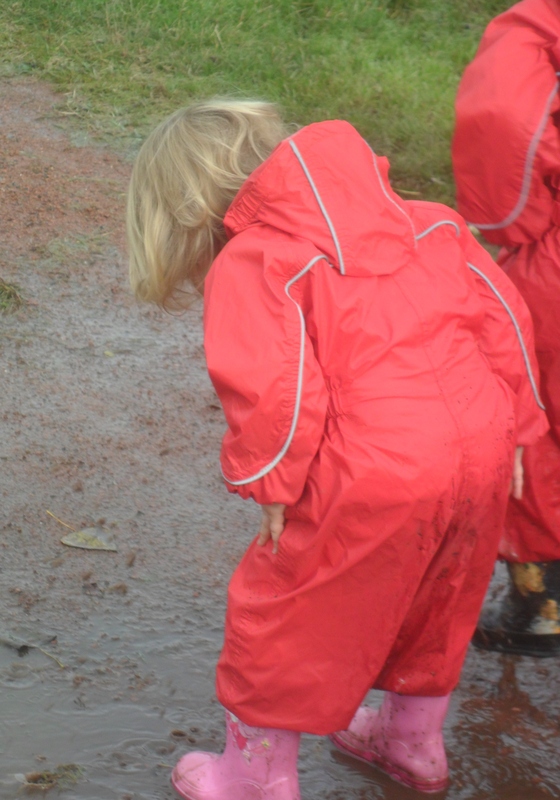 The only time Penny tried to stop the puddle jumping was when they found a VERY deep puddle – as in half way up their wellies – which of course meant when they jumped it went over the wellies. 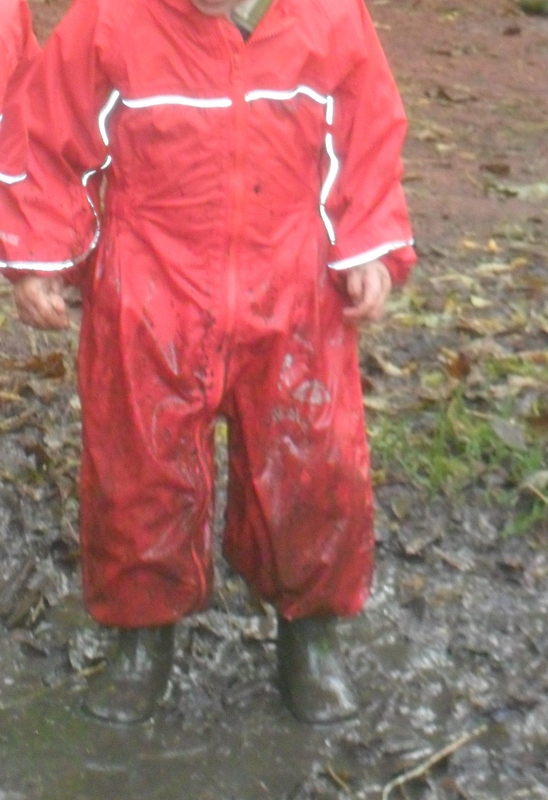 I say tried – because the children would comply and come out of that particular puddle – only to jump straight back in! After a while we moved onto the play park and ate our picnic – however the children were so eager to explore the equipment and play in the sand – that they said they did not want fruit or (more surprisingly) cake! No – Chinzia has not fallen over – she is doing some large scale mark marking with her arms – look and you can see the circle she has made – all her own idea – and she was very pleased with the result. A lovely day out and great fun – however when we got back to the car Penny discovered that the children’s wellies were full of sand, and muddy water – and their socks – well no matter how clean or what colour the socks had started out being that morning, they were all now a uniform yucky brown colour! Back at Penny’s Place – Penny washed socks and splash suits FOUR times by hand and they still were not clean . A wash in the washing machine also did not get the socks clean or remove the brown stain from the seams of the suits!